The truth is, I'm scared of the rooster. 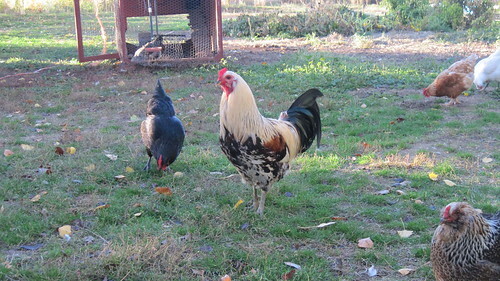 He's mean and aggressive and I rarely let him out of the chicken coop. I've had to whack him with my long stick to protect myself from his sharp spurs and beak. But he's pretty as all get out, right? There are animals I'm afraid of and some that I'm not. Skunks, yes. I do not open the doors when the skunks are about. Raccoons, no. I have been known to toss a big glass of water out the back door to scare off a raccoon. Once I stood on the bench until the raccoon came out from under the deck just so I could drench him. Because sometimes I'm mean that way. Since I last posted about goose eggs we've been getting up to three eggs each day. I've also been able to determine that I indeed have 3 geese and 6 ganders. There are days when I let the geese wander around the yard and forage all day and so far they have escaped fox attacks, despite that fact that I know the fox has a den just over the fence. Our spring has been cool and latecoming so the garden isn't even started but I'm confident that we'll get something planted before its too late.